Wow! Where has the time gone? Another year of school is almost over. Maybe it is because this year has been jam packed full of exciting changes for us that it seems to have flown by. Since the beginning of September we have; busted our butts on home renovations, sold a house, went on house hunting trips, purchased a new house, moved across Canada, unpacked and started on more home renovations. I've got to hand it to my kids, the have been really amazing with the whole transition. Moving in the middle of a school year is not an easy thing to do. My (almost 13 year old) daughter was my biggest concern because thirteen is a really difficult age to start over with friends and school. Astonishingly, I just attended an end of year assembly this morning where she received an award for her character...…Gotta' say I'm a pretty proud momma at the moment. Not only was I blessed with amazing kids, but we have also been blessed with finding a wonderful community with a great school full of caring staff and teachers. My son has Type 1 Diabetes, so coming into a new school in the middle of a school year is not only a big challenge for him, but also a huge undertaking for the teacher. Not only was she getting a new student but a student with medical needs that require extra care and attention on a daily basis. I cannot express how truly amazing it has been to have her care for and teach my son. As a small gesture of appreciation I wanted to give her a little gift at the end of the year. Giving an apple to a teacher is a symbol of appreciation. Out of curiosity, I googled why an apple is given to a teacher as a symbol of appreciation. 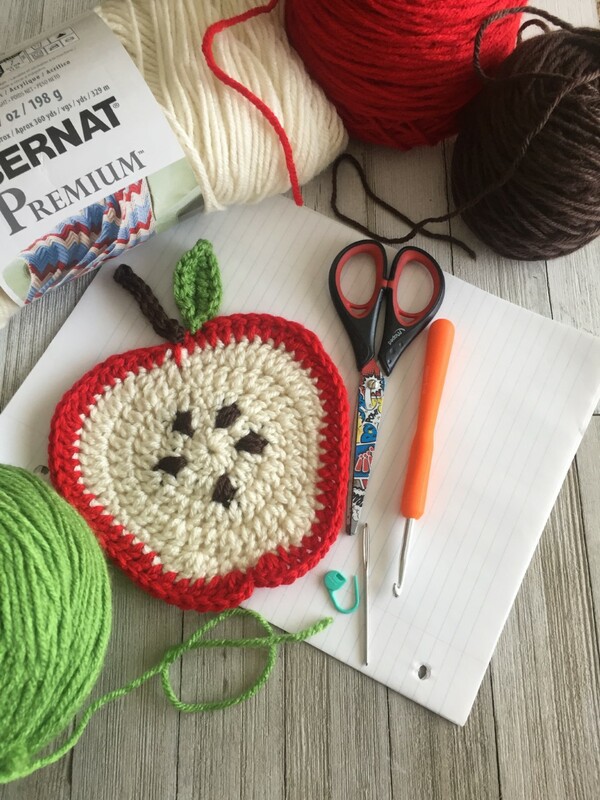 Basically, it said that apples are in season in September when the school year begins so apples were a common item to give to teachers as a form of payment for their services. Also I wanted to give a gift that was useful and wouldn't go to waste, but at the same time had a personal touch to show that I put thought and time into the gift. To recap, I wanted something handmade that could be useful and was the traditional symbol of appreciation for a teacher. So, I decided to crochet apple dishcloths that I could add to a little gift basket for my sons teacher. On the second round I like to incorporate the brown for the apple seeds in the round because it makes the finished product look nice and neat. If you prefer not to add the brown in this round then just do 2 dc in each stitch around to give you 20 sts, then stitch in the apple seeds in brown when the apple is finished. I have written the pattern to reflect adding the brown into the second round. sl st in first ch from hook, sc, Hdc, dc, dc, Hdc, sc, sl st, chain 1 and work around to other side of leaf, sl st, sc, Hdc, dc, dc, Hdc, sc, sl st, ch1 sl st to beginning st. Pull through long tail, weave down the middle of the leaf so that both tails are on the same end of the leaf and tie leaf onto apple. Weave in ends. 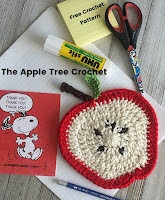 Stem - using brown crochet an icord to desired length and tie onto apple. Comment below with any questions or just to say hey!